Like most girls, I enjoy shopping for pants about as much as I enjoy catching a cold, so whenever I stumble across a pair that combines comfort and fit I tend to buy them in as many colors and prints as possible. Since attending the fabulous Loft event with Giuliana Rancic last month and getting a preview of their fall collection, I've been anxiously waiting for it to hit stores before stocking up on skinnies for fall. Now that the collection is finally available I simply can't get enough. Their new super skinny pants come in a rainbow of colors as well as a variety of super trendy prints. This weekend I picked up the velvet snow tiger skinny pants as well as the super skinny corduroys in beet. Loft's fab collection of skinnies come in modern super skinny as well as curvy super skinny! Fash Tip: This fall be sure to add a pair of colored pants as well as a printed pant to your wardrobe. These statement bottoms look fabulous with a solid colored knit sweater or a simple tee and cardigan. These versatile standout pants are sure to be an asset to your winter wardrobe so don't hesitate when it comes to taking the purchase plunge. Below are some of my favorite pairs of pants popping up in Lofts latest collection. Be sure to check out all of their new arrivals here! I am OBSESSED with your shoes! and your outfit is just wayyyy too cute! you look stunning as usual! omg i LOVE LOVE LOVE this outfit! super great styling! I really like this outfit. Those pants are a great print and I have the same necklace. I'm planning to wear it to my grandmas for christmas dinner. Wow! Awesome outfit yet again! Amazing! Love the outfit... Such a great combo! great outfit and everything is matching together perfectly. Gorgeous Anna! I love that shirt!! Best outfit ever. The heels are all kinds of amaze balls. Hope you had a great weekend, hun. This is one of your most beautiful outfites to date! You look stunnigly beautilful!! :) I love everything about the outfit - the coloured pants, the yellow blouse, the blazer - everything!! I feel your pain. Shopping for pants is the worst, but when it comes to this outfits, words can not describe how much I love it. The ankle boots are so fab. Amazing combination dear, love the blouse! You looking gorgeous Anna. Love the pants. They are really amazing. You never cease to amaze me, Anna. Your styling here is spot on. I have to get this necklace. So elegant. You look beautiful. I always get excited when I see you wear pants. These are amazing. I'll have to check out their stuff. Glad they have something for us curvy gals. lol. Adore your nail polish. A flawless choice for fall. How fab are those trousers! love these skinny pants! will check out loft! This outfit has so much personality and great styling, I'm in awe. Great job, Anna. wooow love this post!! the print is gorgeous :) i'm really a fan of you! love the blouse with the pants. very nice combo! Love your pants! You look incredible! Love the dark leopard print skinnies paired with the brighter yellow shirt! Winning pair! Those printed pants are amazing...loving this entire look! this ist the best color combination ! Hey doll! I see you're still looking Ah-mazing! Love the mix of yellows and black. It's funny because usually I'd think those colors would look a little bee-ish but you make it look great! Love your outfit! I'd love to recreate something like this for work, but I'm required to wear black, white & gray (BOR-ING!!). These pants are super cute nonetheless. Anna, couldn't agree more, printed skinnies are such a great way to mix up an outfit! those pants looks great on you! Great outfit! I love the print! Love those skinnies they are so much fun! Thanks so much for stopping by my page! :) Love this outfit! Love these pants! Great outfit! love the look-- the necklace gives it a great elegance while it's still fun and flirty with the pants! as always, lovely! such a fun outfit - love the colour combo && that nail colour too!! Definitely statement pants and they are totally awesome. You look stunning! Great pants! Love the whole look. Thanks so much for stopping by my blog. Yes, I'd love to follow each other. Just added you on bloglovin. Oh my gosh I love those pants!! I need a pair! I love the yellow top with them too! Great combo!! Love these! This is so bad but there's a Loft right down the street from my office - I kind of want to go pick some up at lunchtime! Printed pants are one of my favorite trends! Adds so much to an outfit. the cuff on the pants definitely makes the outfit for me, love it! I hate shopping for bottoms too! It's the worst and so complicated which is prob. why I have way more tops than pants. 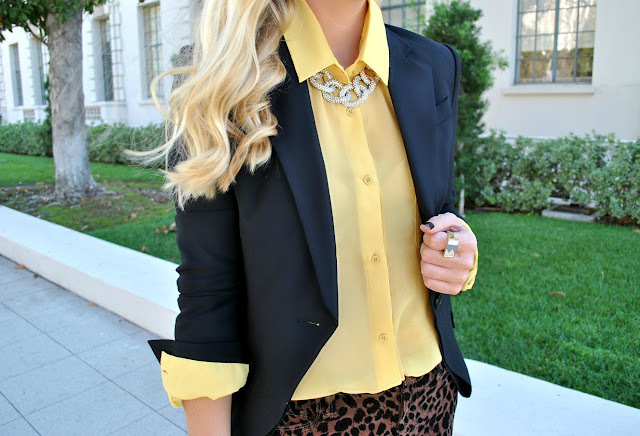 I love the leopard print paired with yellow blouse, it's a fun and unexpected combination! If you got a minute, I would love if you could out my latest Outfit Post! 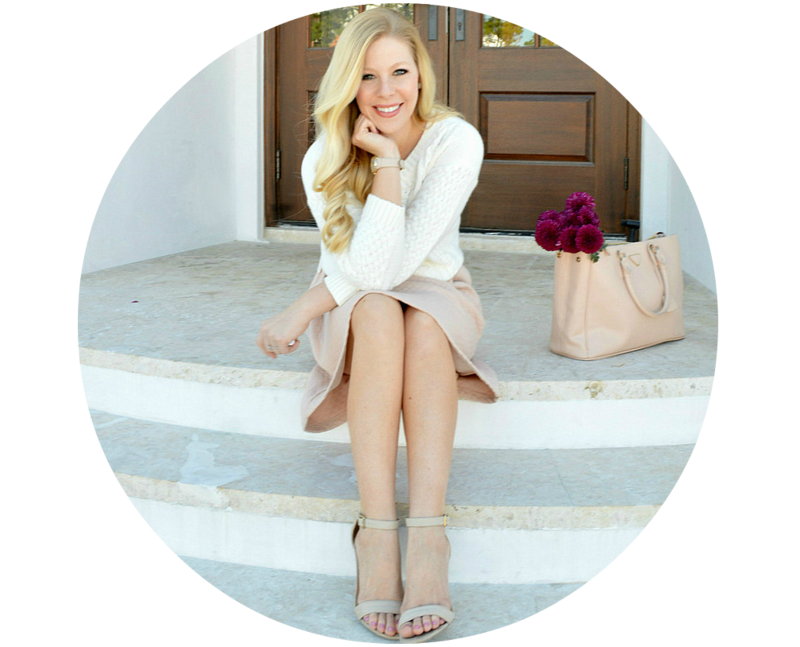 So happy I found your blog - I'm excited to follow along! So cute! thanks for stopping by my blog. I love yours! LOve the skinnies. That's awesome that you got to meet Giuliana Rancic. thank you for the comment sweet girl! I'm personally obsessed with Loft at the moment, it has been alllll over my blog (here, for example). There's a pair of metallic printed jeans that I've been drooling over. Love the yellow shirt and the necklace for breast cancer awareness!! this is a great look! love the pants! They're absolutely gorgeous!! I have no idea why pants are so difficult to find!! I'd much rather wear skirts and dresses. You look amazing, Anna. Love this outfit. Love how you combined everything. Yellow is a great color on you. Lovely. Ha I prefer not shopping for pants either! Especially with these skinny jeans and the super tight fit, I often feel like I am stuffing sausage (its kinda uncomfortable and embarassing to say the least). Love these skinnies! Also, love how you rolled them up and paired with booties, your looks are always perfect! Super cute!! Love these pants! I love this! Amazing stuff. The shoes and the pants are lovely and the blazer is to die for! Wow these pants are amazing! Love them paired with a yellow button up and black blazer, great mix! More than obsessed with this look. So chic!!!!!!! I love the skinny jeans! They looks great on you and what wonderful choices there are for the holiday season! I've been hesitant about buying printed pants, but you totally sold me with this pair! You look great! Would love for you to stop by my blog! Love all these colors together! The black, yellow, and leopard look fabulous! And those booties are gorgeous:)! Beautiful girl! Oh my GOSH, such a cute outfit!! I don't have any leopard pants, but you might have convinced me I need some! Colored skinnies, on the other hand, I have in every color imaginable!! Love! I love the color of that leopard print! Great outfit! Lovely outfit!! Love your necklace. We have the same shoes, they're my fave Shoemint has come out with!! Love the chetah with the yellow! Love those pants ! And that necklace is amazing ! Love your blog! Love the leopard skinnies! Keep it up! Love that look, Anna! LOFT has such cute stuff lately (/always). Will definitely have to try on some of those printed skinnies! I used to think that loft was geared towards an older crowd but over the last year my closet has slowly filled with many of their classic and well made pieces! lovely look, the jeans are amazing they have such a nice fit, and i adore the shoes !! Agree with you printed pants are must-haves for the fall-winter! It is always so inspiring to see how you layer and style your outfits! Wow your blog is so amazing it's full of great fabulous pictures..
Gorgeous combo, those pants are awesome. 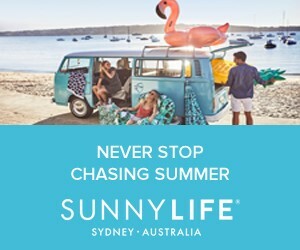 I just discovered your blog and I love it ! I read your presentation and I'm so happy for your career as you say every dream is possible! And I hope it will be for me too. I dream of a career like yours. Nice combo the yellow and the leopard print, you rocks!!! I SOOO love this outfit. It rocks, leopard is my favorite!